Norse Energy Corp. v. Town of Dryden: Court upholds New York town's fracking ban. For a while, it looked like we were scraping the bottom of Earth’s barrel of fossil fuels. Then along came hydraulic fracturing (fracking) and horizontal drilling, and now some argue that we might never run out of the stuff, though not everyone agrees. But as exploitation of oil and gas has intensified, so has opposition. The most significant resistance is coming from the towns and cities that are becoming sacrifice zones in the wake of corporate profits and the national quest for energy independence. Local government is the one entity that might throw a wrench in the works, because they actually have some legal power. The burning question is: How much power? For the past six weeks, a New York appellate court has been hashing this out in the case of Norse Energy Corp. v. Town of Dryden. In 2011, the little town of Dryden, N.Y., banned gas drilling and was promptly sued by a multibillion dollar energy company. A year ago, Dryden won its first battle in a New York Supreme Court ruling. Just yesterday, it won the second. Indeed, the people of Dryden didn’t beat the industry—they pummeled it. The Appellate Court just handed New York towns and cities a very heavy stick in the jurisdictional street brawl over fracking. Norse can appeal (and my sources say they are planning on it), but because this was a unanimous decision they’ll have to first get the court’s permission, and that may be challenging. Norse Energy argued that Dryden’s zoning ordinance was preempted and thus rendered invalid by the New York Oil, Gas, and Solution Mining Law (OGSML). This set up a showdown in the perennial tug-of-war between state and local governments. Cities and towns in New York have home-rule powers, which give them the authority to manage local affairs. But these powers can be preempted (overruled) by the state under certain conditions. The central ambiguity in the case stems from the split personality of fracking. On one hand, it is a technical industrial operation. On the other hand, it is a local land use. State government typically regulates the former. Local government typically regulates the latter. Norse argued that Dryden was trying to do the state’s job by regulating an industrial process governed by the OGSML. The court wasn’t swayed: The zoning ordinance doesn’t regulate the mining industry; rather, “it simply establishes permissible and prohibited uses of land within the Town for the purpose of regulating land generally.” In other words, the ordinance is not about the oil and gas industry. It is about such traditional land use considerations as “proximity to nonindustrial districts, compatibility with neighboring land uses, and noise and air pollution.” The best part of the ruling is a smack-down to the state’s natural lust for minerals. Just because the state has a policy of “fostering and promoting” extractive industry does not mean cities are obligated to roll over. 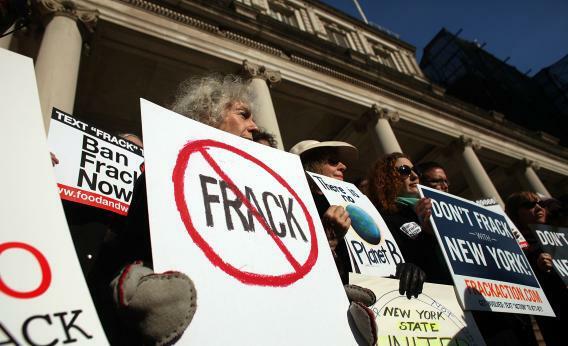 So cities can ban fracking—at least in New York, where a state-wide moratorium is in effect until 2015 anyway. That’s the legal side of it, and it harmonizes with the ethical side: Cities should have the ultimate say over fracking, including the right to ban it if they so choose. The vital good at stake here is local self-determination. If a well is planned near your home or your child’s school, you ought to be involved in that decision, and local government is the only political institution that will be responsive. I’ve learned that from those in Denton County, Texas, who do not have the protections afforded by the City of Denton. (I’ve been an active participant in the discussion about fracking in Denton.) In the county, they all have wells right outside their doors and behind their driveway basketball hoops, because only state laws apply. And according to the state, you are not a person in a place but a node on an energy network. After Longmont, Co., outlawed natural gas production, I asked whether cities should ban fracking. I still think that is a complex question. But should cities have the legal authority to ban fracking? I think the answer to that is much simpler. Yes. Cities should have ultimate say, because the land use identity of fracking is more humanly significant than its industrial identity. Put it this way: A gas well “incident” in Denton just dosed us with an estimated 59 pounds of carcinogenic benzene in one shot. What’s worse is that the industry is allowed (by state law) to emit 55 pounds of benzene every day. This might be the cost of doing business—and I’m not being facetious. But given that the lungs of local residents are paying that cost, they ought to be the ones to decide whether it’s worth it.